Monday, April 1st, 2019, 7:00 p.m. 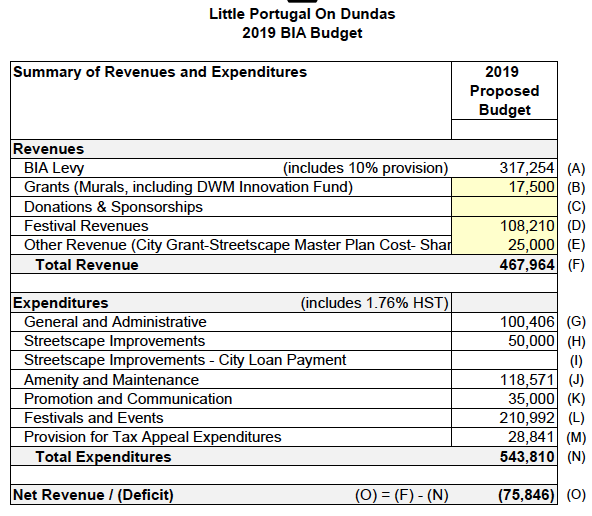 The purpose of this meeting is to decide on the BIA's program and budget for 2019 (see page 3). This program is paid for by a special levy charged to BIA members. As a member of the BIA, the best way to participate in the decisions your BIA is making on your behalf is to get involved. If you wish to obtain a copy of the complete proposed budget or audited financial statement, please contact the BIA. We look forward to you attending the meeting to learn more about the improvements being made within your business area. Only members of the BIA are eligible to vote at the Annual General Meeting. In City of Toronto Municipal Code. Chapter 19, Business Improvement Members are defined as "all persons who own rateable property in a business property class and all persons who are non-residential tenants of rateable property in a business property class in a business improvement area.” A "person" is defined by Chapter 19 to include "a corporation and the heirs, executors, administrators or other legal representatives of a person to whom the context can apply according to law." No person in attendance shall have more than one vote.